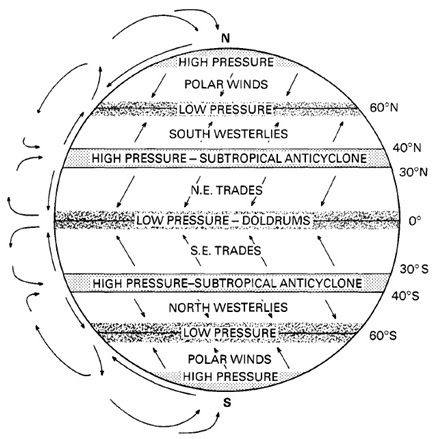 The diagram gives the general pressure and wind systems which would exist if the entire surface of earth was water only. Since such is not the case, variation of the above conditions occurs over large areas of land. A permanent low over the equator called the doldrums or Inter-Tropical Convergence Zone (ITCZ). Permanent highs at about 30˚N & 30˚S. Permanent lows at about 60˚N & 60˚S. Polar winds above 60˚N & 60˚S.